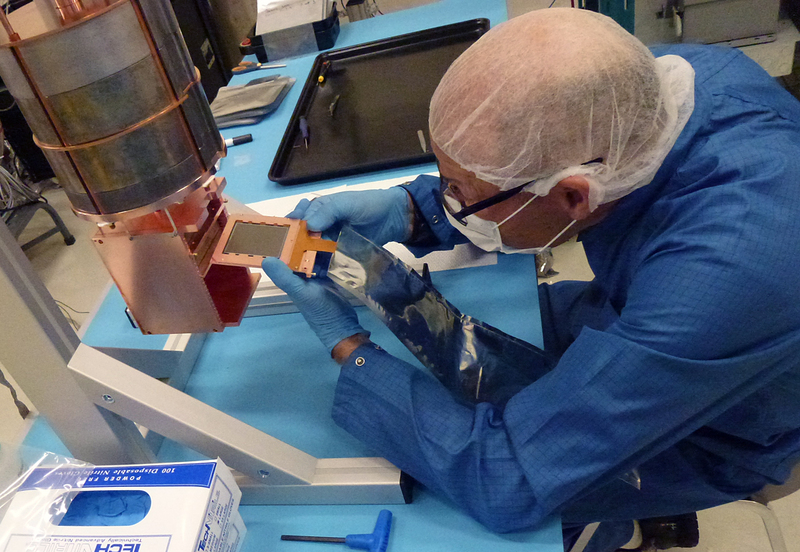 A packaged CCD being inserted in the copper box. Above the box is a lead cylinder shielding the CCDs from radiogenic backgrounds. DAMIC100 comprises 18 CCDs for a total mass of 100 g.
The DAMIC (Dark Matter In CCDs) experiment employs a new technique for searching for the elusive particles that we think make up most of the matter in the universe -- dark matter. DAMIC uses charged coupled devices -- the CCDs that have been used for many years in digital cameras, but these are not your average CCDs. They are the high-tech ones also used in the Dark Energy Camera, which Fermilab installed on the Blanco telescope in Chile. The detectors were developed and fabricated at Berkeley Lab and were tested and installed in the camera at Fermilab. They are unusually thick (250 microns instead of the usual 30) and have low intrinsic noise levels, making them ideal for the long exposure times needed to search for the rare interactions expected for dark-matter particles.